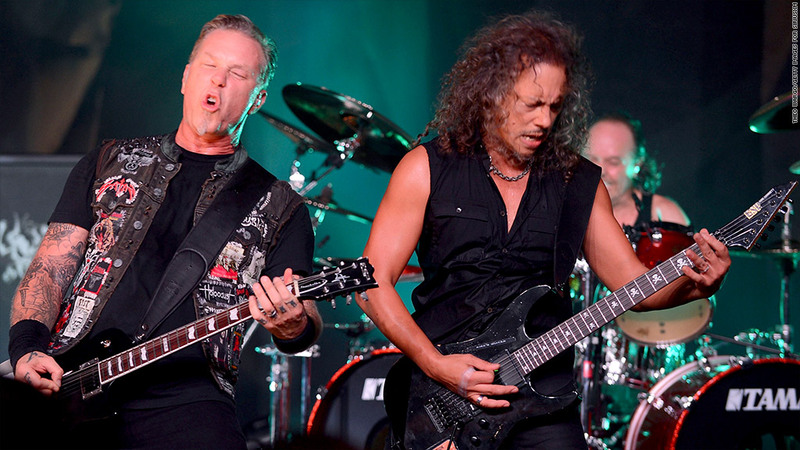 Kirk Hammett (right) may want to wear a shirt with sleeves when Metallica plays in Antarctica this December. Metallica will play a concert at its remotest location yet -- Antarctica -- as part of a promotional stunt sponsored by Coca Cola. "After over 30 years as a band, we have been unbelievably fortunate to visit just about every corner of the earth . . . except for one," announced the band on its web site. "That is all about to change as we are set travel to Antarctica, the only continent that Metallica has never played on until now!!" The heavy metal band, known for such classics as "Trapped Under Ice," said it is partnering with Coca Cola Zero for a performance on Dec. 8 near a heliport at the Carlini Station in the South Pole. The base is located on King George Island, also known as Isla 25 de Mayo, and controlled by Argentina. Coca Cola (KO) and the band are inviting fans from Argentina, Chile, Colombia, Costa Rica and Mexico to enter a contest via Twitter. A total of 10 winners will be chosen to take an eight-day cruise from Tierra del Fuego to Antarctica to attend the concert, which features the band's frontman James Hetfield and drummer Lars Ulrich as well as Kirk Hammett and Robert Trujillo. The band and Coca Cola did not explain why only five countries are covered by the promo. December is the peak of summer in the Southern Hemisphere, so Metallica is playing during the warmest time of the year. However, anticipating some inclement weather at the frigid pole, they're planning to perform under a dome. The band didn't respond to CNNMoney's inquiry as to whether they'll be playing "Trapped Under Ice."